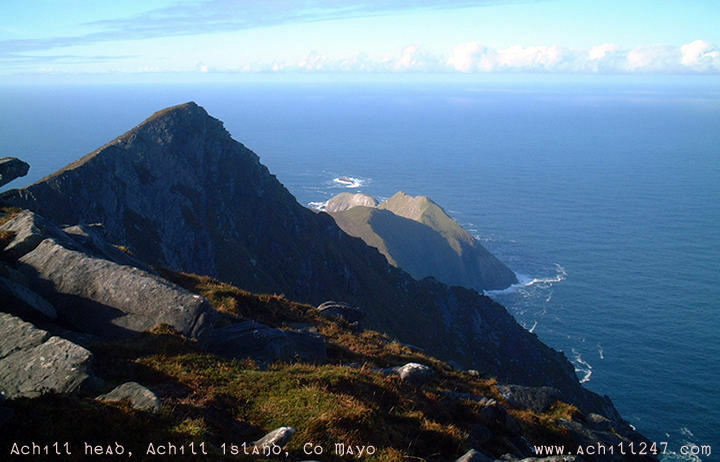 Achill Head (Ceann Acla) is the most westerly point of Achill Island, extending into the Atlantic Ocean and pointing towards New York and the north-east coast of the United States ('the next parish'). This photograph in Achill 24/7's series of Ireland pictures was taken from the summit of Croaghaun (Cruachán), Achill's second highest mountain at 668m. The dramatic cliffs of Croaghaun, said to be the highest sea cliffs in Europe, descend immediately to the right in this picture. The remote cliffs of Croaghaun are home to some rare birdlife, including the protected species chough and the peregrine falcon.